We’d love your help. 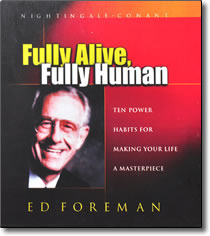 Let us know what’s wrong with this preview of Fully Alive Fully Human by Ed Foreman. In "Fully Alive, Fully Human", Ed Foreman introduces you to his personal, proven formula for successful living that will turn your life into a masterpiece of health, wealth, and happiness. These principles have been used by Ed and thousand of his students, with tremendous results. Apply them, and you'll experience dramatic improvements in every area of your life. To ask other readers questions about Fully Alive Fully Human, please sign up. Many lessons on obtaining health and wellness. There is a meditation at the end of the audio series that will put you in state of relaxation.